Set between chapters 15 and 16 of Carlo Collodi's classic novel 'The Adventures of Pinocchio', 'The Tree Man' depicts Pinocchio's seemingly final minutes as he hangs from a tree. Synopsis: Set between chapters 15 and 16 of Carlo Collodi's classic novel 'The Adventures of Pinocchio', 'The Tree Man' depicts Pinocchio's seemingly final minutes as he hangs from a tree. As he slowly dies, he spiritually journeys into an inferno of fear, guilt and hope through his encounters with key symbolic characters such as the Maiden with Azure Hair and the ghost of the Talking Cricket. As he falls deeper into darkness, Pinocchio learns the cruical dangers and virtues of the mortality he seeks. Remaining faithful to Collodi's characters, world and intentions, 'The Tree Man' narrates a new chapter in the story of Pinocchio utilising traditional film making tools such as puppetry, elborative and highly detailed costumes and sets. The film introduces a comtemporary audience to concepts within 'The Adventures of Pinocchio' that have unfortunately been lost through time and various misinterpreatations of the tale. 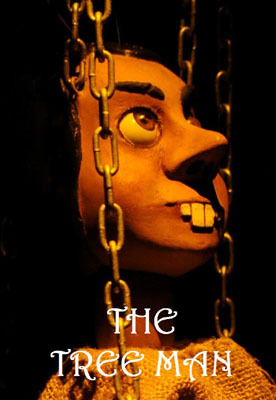 'The Tree Man'' shows how this original novel was one of unique dark humor and the not only the journey of a puppet who wanted to be a real boy but of a trapped soul venturing forth to find its identity in our often alienating and cruel world.The film brings in a new character to aid to reintroduce some of these concepts to the audience whilst utterly not disturbing the uinverse of the original story. 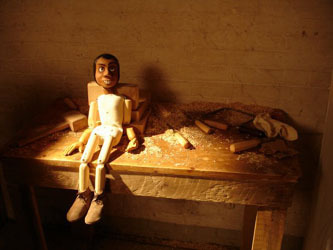 'Death' is portrayed in the film as Pinocchio's one glimpse at an understanding of his own past mischievous acts, his guilt and the ultimate salvation he seeks.